In 2010, the National Centre for Arts and Health at AMNCH hosted a residency funded by The Arts Council of Ireland. Ian Wilson was Composer-in-Residence at the stroke unit for three months. Wilson wrote a new work for Soprano (Ms Deirdre Moynihan) and String Quartet (2 violins, viola and double bass) based on the experiences of patients with stroke and staff in the unit. The final work is entitled Bewitched. During the residency members of The Irish Chamber Orchestra performed for patients and conducted open rehearsals of the composition in progress. Patients and staff in the Age Related Health Care Unit were crucial to developing this new work. 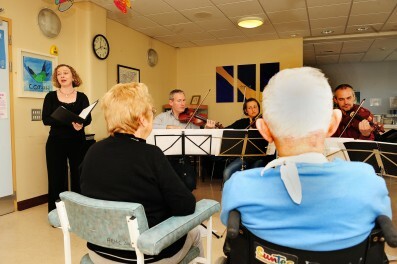 Arts Care is Northern Ireland’s leading arts in health organisation. We require a dynamic and imaginative Operational Manager to manage the artistic and operational development of the NIClownDoctor (NICD) programme and also to assist with operational duties in relation to the artists-in-residence programme. Kildare County Council Arts Service invites applications from professional artists across artforms with an interest in working with children in healthcare to participate in a new Artist Mentoring Programme. Facilitated in partnership with Barretstown and Helium, this programme offers artists a unique opportunity to receive training, experience the recreational activity model, develop their facilitation skills and reflect on scope for potential project development. The Open Door: Drop in … Listen or Sing! In November 2011 West Cork Mental Health Services appointed Kevin O’ Shanahan as an Arts and Mental Health Co Ordinator to investigate the potential for developing arts and health activities in the wider West Cork community. This post will be a pilot position, initially of one year and one aspect of this job will be to develop partnerships between West Cork Mental Health Services and other community groups and services. As part of this process and in partnership with West Cork Arts Centre and MusicAlive, West Cork Mental Health Services are planning an exciting participative based music project entitled The Open Door. 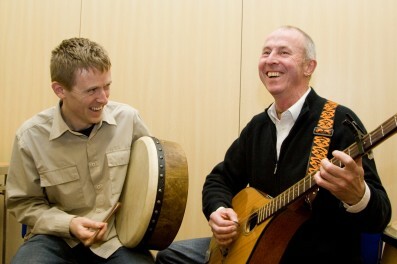 This project will commence on Thursday 23 February 2012 in the West Cork Arts Centre and continue every Thursday in March from 7 to 8pm. Twice yearly, the Arts Council offers grants to enable artists and communities of place/or interest to work together on collaborative arts projects. The scheme is open to artists from any of the following artform disciplines: architecture, circus, street art and spectacle, dance, film, literature (Irish and English language), music, opera, theatre, visual arts and traditional arts. The projects can take place in a diverse range of social and community contexts such as arts and health; arts in prisons; arts and older people; arts and cultural diversity.